••• Image copyright © Strategic Metal Investments Ltd.
Germanium is a rare, silver-colored semiconductor metal that is used in infrared technology, fiber optic cables, and solar cells. Technically, germanium is classified as a metalloid or semi-metal. One of a group of elements that possess properties of both metals and non-metals. In its metallic form, germanium is silver in color, hard, and brittle. Germanium's unique characteristics include its transparency to near-infrared electromagnetic radiation (at wavelengths between 1600-1800 nanometers), its high refractive index, and its low optical dispersion. The metalloid is also intrinsically semiconductive. Demitri Mendeleev, the father of the periodic table, predicted the existence of element number 32, which he named ekasilicon, in 1869. Seventeen years later chemist Clemens A. Winkler discovered and isolated the element from the rare mineral argyrodite (Ag8GeS6). He named the element after his homeland, Germany. During the 1920s, research into the electrical properties of germanium resulted in the development of high purity, single-crystal germanium. Single-crystal germanium was used as rectifying diodes in microwave radar receivers during World War II. The first commercial application for germanium came after the war, following the invention of transistors by John Bardeen, Walter Brattain, and William Shockley at Bell Labs in December of 1947. In the years following, germanium-containing transistors found their way into telephone switching equipment, military computers, hearing aids and portable radios. Things began to change after 1954, however, when Gordon Teal of Texas Instruments invented a silicon transistor. Germanium transistors had a tendency to fail at high temperatures, a problem that could be solved with silicon. Until Teal, no one had been able to produce silicon with a high enough purity to replace germanium, but after 1954 silicon began replacing germanium in electronic transistors, and by the mid-1960s, germanium transistors were virtually non-existent. New applications were to come. The success of germanium in early transistors led to more research and the realization of germanium's infrared properties. Ultimately, this resulted in the metalloid being used as a key component of infrared (IR) lenses and windows. The first Voyager space exploration missions launched in the 1970s relied on power produced by silicon-germanium (SiGe) photovoltaic cells (PVCs). Germanium-based PVCs are still critical to satellite operations. The development and expansion or fiber optic networks in the 1990s led to increased demand for germanium, which is used to form the glass core of fiber optic cables. By 2000, high-efficiency PVCs and light-emitting diodes (LEDs) dependent upon germanium substrates had become large consumers of the element. Like most minor metals, germanium is produced as a by-product of base metal refining and is not mined as a primary material. Germanium is most commonly produced from sphalerite zinc ores but is also known to be extracted from fly ash coal (produced from coal power plants) and some copper ores. Regardless of the source of material, all germanium concentrates are first purified using a chlorination and distillation process that produces germanium tetrachloride (GeCl4). Germanium tetrachloride is then hydrolyzed and dried, producing germanium dioxide (GeO2). The oxide is then reduced with hydrogen to form germanium metal powder. Germanium powder is cast into bars at temperatures over 1720.85 °F (938.25 °C). Zone-refining (a process of melting and cooling) the bars isolates and removes impurities and, ultimately, produces high purity germanium bars. 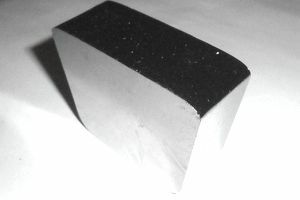 Commercial germanium metal is often more than 99.999% pure. Zone-refined germanium can further be grown into crystals, which are sliced into thin pieces for use in semiconductors and optical lenses. Global production of germanium was estimated by the US Geological Survey (USGS) to be roughly 120 metric tons in 2011 (contained germanium). An estimated 30% of the world's annual germanium production is recycled from scrap materials, such as retired IR lenses. An estimated 60% of germanium used in IR systems is now recycled. The largest germanium producing nations are led by China, where two-thirds of all germanium was produced in 2011. Other major producers include Canada, Russia, the USA, and Belgium. Major germanium producers include Teck Resources Ltd., Yunnan Lincang Xinyuan Germanium Industrial Co., Umicore, and Nanjing Germanium Co.
Germanium crystals are grown and formed into lenses and window for IR or thermal imaging optical systems. About half of all such systems, which are heavily dependent upon military demand, include germanium. Systems include small hand-held and weapon-mounted devices, as well as air, land, and sea-based vehicle-mounted systems. Efforts have been made to grow the commercial market for germanium-based IR systems, such as in high-end cars, but nonmilitary applications still account for only about 12% of demand. Germanium tetrachloride is used as a dopant - or additive - to increase the refractive index in the silica glass core of fiber-optic lines. By incorporating germanium, signal loss is prevented can be prevented. Forms of germanium are also used in substrates to produce PVCs for both space-based (satellites) and terrestrial power generation. Germanium substrates form one layer in multilayer systems that also use gallium, indium phosphide, and gallium arsenide. Such systems, known as concentrated photovoltaics (CPVs) due to their use of concentrating lenses that magnify the solar light before it is converted to energy, have high-efficiency levels but are more costly to manufacture than crystalline silicon or copper-indium-gallium-diselenide (CIGS) cells. Roughly 17 metric tons of germanium dioxide is used as a polymerization catalyst in the production of PET plastics each year. PET plastic is primarily used in food, beverage, and liquid containers. Despite its failure as a transistor in the 1950s, germanium is now used in tandem with silicon in transistor components for some cell phones and wireless devices. SiGe transistors have greater switching speeds and use less power than silicon-based technology. One end-use application for SiGe chips is in automotive safety systems. Other uses for germanium in electronics include in-phase memory chips, which are replacing flash memory in many electronic devices due to their energy-saving benefits, as well as in substrates used in the production of LEDs. USGS. 2010 Minerals Yearbook: Germanium. David E. Guberman.